Worms 2: Armageddon available now for Android! Attention Android fans! 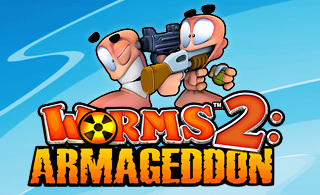 Worms 2: Armageddon is now available to download for Android for £2.99/€3.99/$4.99. Download it now from the Google Play store. Grab your grenades and prepare for battle, as the worms are back, bigger and better than ever in Worms™ 2: Armageddon! The best-selling turn-based-strategy blast-a-thon is now available on Kindle Fire HD, with new weapons, brand new customisation options and of course, more explosions! 12 different Game Styles including new modes Fort Mode and Crazy Crates and the return existing modes Easy, Normal, Pro, ‘Bazooka and Grenade’, Melee, Gun Show, Heads Up, Lightside, Darkside and Sudden Death. You can even create your own Custom Game Style!